The Audi R8 V10 has finally gotten a price to to go with it's extra cylinders and, at $146,000, it's kind of a bargain considering the V8 version can easily flirt with that figure. As part of the 2010 R8 pricing announcement, Audi told us how much green it'll take to get the even more Bruce R8 V10 with 5.2 liters of German fury. At 518 HP and 391 lb-ft of torque, it's not exactly the best bang for the buck, but with a body like that who cares? HERNDON, Va., Jul 23, 2009 - Audi today announced that the U.S. manufacturer's suggested retail price for the highly anticipated 2010 Audi R8 5.2 FSI quattro V10 sports car will start at $146,000, with shipments to authorized Audi R8 dealerships across the country beginning this week. The addition of the R8 V10 adds new levels of power to a sports car already renowned for delivering premium comfort uncommon in its class without performance compromises. The 10-cylinder 525 hp engine is the same power plant found in the R8 LMS GT3 racecar and is capable of delivering breathtaking performance. The Audi R8 5.2 FSI quattro delivers 391 lb-ft of torque and achieves a 0-60 mph time of just 3.7 seconds. Anticipation has been building for the U.S. introduction of the R8 V10. Today, the first two 2010 Audi R8 5.2 FSI quattro models available in the U.S. were delivered to the two winning bidders from the 2009 Boca Raton Concours d' Elegance charity auction held in February to benefit the Boys & Girls Clubs of Broward County, Fla. The two winning bids raised a combined $850,000 for the charity, with the top bidder paying a record $500,000 for the new 2010 R8 V10, the highest amount ever paid for a new Audi vehicle in the U.S. Since its U.S. launch in September 2007, demand has remained strong for the V8-powered R8 4.2 FSI quattro featuring 420 hp and 317 lb-ft of torque. The hand-assembled R8 V10, developed by the Audi high-performance division, quattro GmbH, receives unique exterior features as standard equipment. Chief among these: innovative full-LED headlights, a world's first. The Audi R8 5.2 FSI quattro also receives new 19-inch Y-design forged aluminum alloy wheels with summer performance tires, sideblades with larger air intakes, front grille with chrome-optic accents, unique rocker panel shaping, dual oval rear exhaust tips, "V10" front fender badges and instrument cluster labeling, unique front and rear sections along with a larger rear diffuser all finished in high-gloss black. Other R8 5.2 FSI quattro standard equipment highlights include rear-biased quattro all-wheel drive, Audi magnetic ride, Audi Navigation plus with 3D graphics and real time traffic, 465-watt Bang & Olufsen Sound System®, 6-disc CD changer, Bluetooth® telephone preparation, SIRIUS satellite radio®, Audi parking system plus with rearview camera and 10-way power heated sport seats. Sepang Blue pearl effect will be offered as an optional R8 V10 exclusive exterior color. "The R8 is a proven worldwide success story for Audi," said Johan de Nysschen, President, Audi of America. "The positive effects of the vehicle on dealers, customers, and Audi fans alike have exceeded all expectations. The addition of the V10-powered R8 5.2 FSI quattro adds further equity into the already sought-after R8 nameplate and the Audi brand." The R8 is one of four Audi models currently built with the revolutionary ASF® chassis, a technology that Audi has mastered in more than a decade of experience. ASF is customized by model, including its application with the A8 and TT Coupe and Roadster models. The framework of an ASF body consists of extruded aluminum sections and pressure castings. The aluminum chassis and sheet metal are just as strong as steel, but lighter to boost performance and efficiency. This frame carries the sheet aluminum elements, for example the roof panel, which are rigidly connected to it and help to withstand loads on the body. The elements of ASF are varied in shape and cross-section, depending on the tasks they have to perform. Like the bones of a human skeleton, they combine optimal function with low weight. The ASF application on the Audi R8 offers extremely high torsional rigidity, light weight and high strength for optimal performance characteristics. 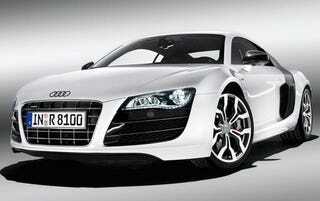 All R8 models are produced in Neckarsulm, Baden Württemberg, Germany along with the aluminum A8 model. Audi is continuing to shape the future in lightweight design and elsewhere too. Inaugurated in 1994, the Aluminum and Lightweight Design Center in Neckarsulm, Germany employs more than 120 specialists to work on new joining techniques, body structures, materials and construction techniques. They also look into the use of high-strength and ultra-high-strength grades of steel. In the area of fiber composites, Audi also acts as an innovative pioneer and trend-setter by leveraging its significant racetrack experience and success to test advanced component concepts under extreme conditions prior to implementation on its road vehicles. Audi expects to release 2010 pricing and model year changes for the remainder of its lineup within the next few weeks.